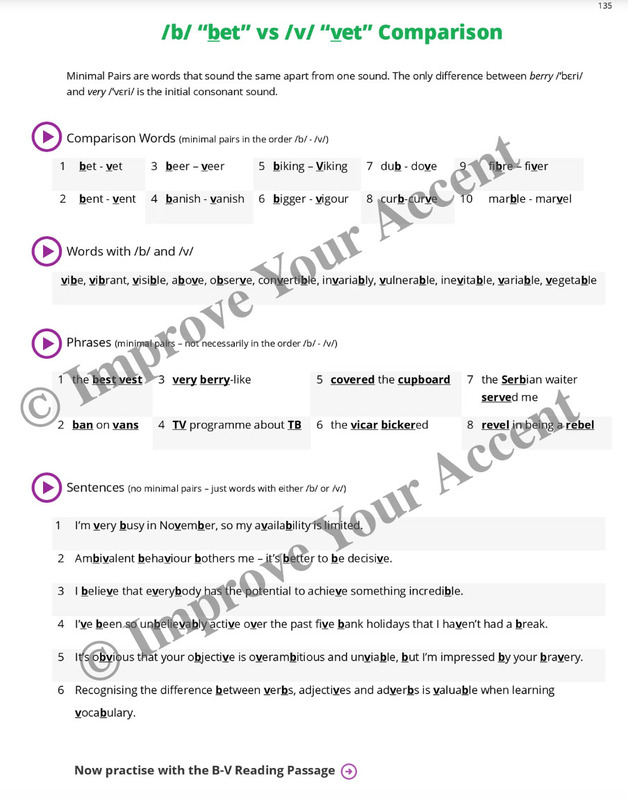 Here you can find some general information on improving your accent, as well as specific information on the online course and private lessons. How long will it take to improve my accent? Speaking is a physical process – we move muscles to create speech sounds. In order to speak in a different accent, you need to re-train those muscles. You have been speaking the way you do since childhood, so it will take some time to change your muscle habits. The online course or my private lessons concentrate on what will make the biggest and obvious improvements to your accent first. Your current level of English pronunciation. Your native language (and how close the sound system is to English). Whether you approach the learning with a positive mindset or not. How quickly your speech muscles adapt. Whether you are comfortable creating unfamiliar (=English) sounds. Like all new skills, some people are naturally good at it, and others have to work harder. Most people will notice improvements after a few months. Can adults still learn new sounds? Some people believe that only young children can acquire new sounds. This isn’t true because I have worked with hundreds of adult learners who have successfully learned new sounds and changed their accent. It doesn’t matter how old you are, or how long you have been speaking English. 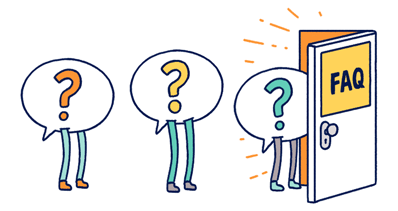 It’s simply a question of re-training your speech muscles and lots of practice. As much as possible. The more you practise, the more you will improve. It is important to do short, regular practice sessions every day – rather than practise for an hour once a week. If you practise over a long time period, your new accent will be habitual and you’ll be able to do it instinctively. Is it possible to sound exactly like a native English speaker? It is certainly possible, but most people won’t get to this stage. Unless you are an actor playing an English character, sounding exactly like a native is not very important. Your non-English background is part of your USP (Unique Selling Point) and having an accent is a positive attribute. Remember that your accent reflects your identity – so having a hint of French/German/Spanish/Japanese in your voice tells people who you are. Your priority as a non-native speaker is to be able to communicate as easily as possible with native speakers. Your second priority may be to sound as English as possible (rather than 100% English). Of course I can help those who want to sound exactly like a native speaker. But remember that this may take a huge amount of time and guided practice in order to integrate it into your everyday speech – and there is no guarantee that you will succeed. For actors, it is slightly easier because there usually a script to learn and so the words/sentences can be practised over and over again. Will this improve my listening comprehension skills? By learning the sounds that native speakers make and their rhythm, you will be able to understand words and sentences more easily. What kind of English accent will I be learning? You will be learning the Standard Southern British English Accent, which is based on the accent in South-East England. You may have also heard of this accent as Non-Regional Pronunciation (NRP) or Modern RP. It is perceived as a neutral*, intelligible, and contemporary English accent. It is associated with education, prestige and wealth. For this reason, it is the best accent to learn. 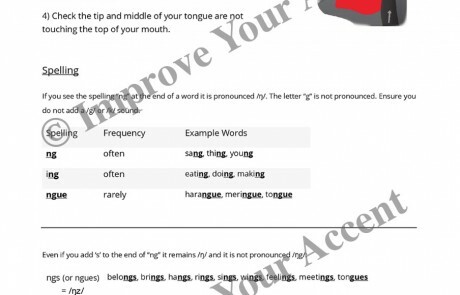 You may have also heard of the terms Received Pronunciation (RP), BBC English, or Oxford English. In my opinion, these names tend to refer to a more old-fashioned English accent, but some people might use them to refer to a contemporary accent. Where can I listen to examples of this English accent? What does it mean to Improve Your Accent? By improve I mean changing sounds so that you are better understood in English. For example, if you can’t make a difference between the words sheep and ship, then learning to distinguish these vowels is a priority. Once you are able to make this distinction, then it is clear you have improved. It’s not just sounds, but also rhythm and intonation that may need adjusting. By accent I mean improving your English accent, as I imagine you don’t have much difficulty communicating in your native language. Is this the same as accent reduction / accent softening / elocution? Yes, they all refer to the same process. But I don’t like accent reduction or softening because they suggest you will lose your accent. In fact, you are simply changing the sounds in your accent. I also dislike the term elocution because it suggests an old-fashioned and uninteresting way of teaching. It also implies that the way you currently speak is wrong and unattractive. My philosophy is that you simply have a Spanish/Chinese/French/[insert your language] accent and we are moving you towards an English one. There is nothing wrong or unattractive about a Spanish/Chinese/French/etc accent, but you may want to adopt English sounds to become more intelligible when speaking English. The two terms are often used interchangeably, but there is a difference in meaning. Accent usually refers to a distinctive way of pronouncing a language, especially one associated with a particular country, area, or social class. That’s why I talk about the Standard Southern British English Accent on my website. The term accent can describe the way in which vowels and consonants are pronounced as well as rhythm, intonation and voice quality. Pronunciation usually refers to the way in which a word is said. So this term is used more with specific sounds (like vowels or consonants) without any geographical or social connotations. First you explore how the mouth works. Remember that speech is physical activity. It’s important to understand how the mouth muscles work, so you are able to change the way you speak. The course provides different physical exercises to make the mouth muscles stronger and more flexible. This will give you the control to create new sounds more easily. Don’t worry if you dislike phonetics – they are not essential to improving your accent. The majority of non-native speakers will have problems with these sounds. Different people will encounter different problems when approaching English pronunciation depending on their native language (a Chinese speaker will have very different challenges compared to a Spanish speaker). For this reason the remainder of the course is organised according to your native language (just to be clear, the course is still in English). 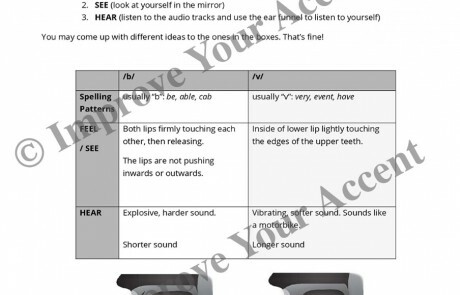 The course prioritises the sounds that will make the biggest differences to your accent. There are over 15 more pronunciation topics that have been chosen and ordered according to your native language. Priority is given to sounds that will improve intelligibility (=people understanding you). Helpful comparisons are made between the sounds in your language and in English. The course gives clear instructions on how to practise and how to incorporate new sounds into your everyday speech. After studying this course, you will have a deeper understanding of English pronunciation and you will be able to communicate more effectively in English. 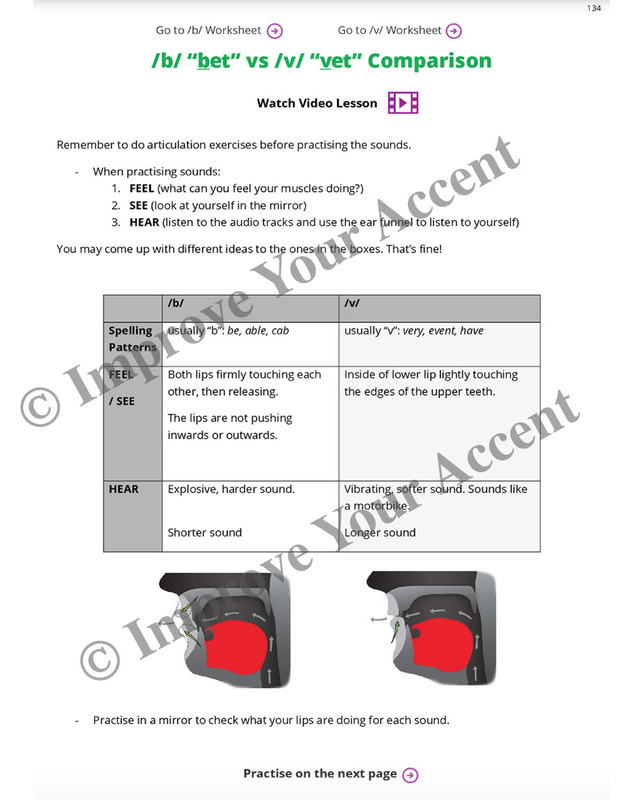 Is this the best and most comprehensive course for English pronunciation? Unlike other courses or textbooks, my course is organised according to your native language. This means you will concentrate on the most important aspects for you first (and don’t have to learn the parts that you can do already). uses a sense-based approach: for each new vowel or consonant, we explore how it feels in the mouth, what it looks like in the mirror, and how it sounds. This allows you to learn quickly and accurately. teaches contemporary British English pronunciation. I want you to sound like a normal English person rather than making you sound like the Queen (i.e. a very old-fashioned and posh form of English which would sound humorous to a native speaker). You can read a comprehensive comparison between my course and other available textbooks here. How do I know if I'm making a sound correctly? The course uses a sense-based approach: for each new vowel or consonant, we explore how it feels in the mouth, what it looks like in the mirror, and how it sounds. This trains you to be able to understand whether you are making a sound correctly or not. Additionally, there are high-quality video lessons, audio recordings, and detailed worksheets with diagrams to help you. At the beginning of the course, you record a text which contains all the sounds in English. This recording acts as a benchmark. You then re-record the text at certain points in the course so you can measure your improvement. How is the course tailored to my native language? Your native language has a sound system that is different from the sound system of English. It is also different from the sound systems of other languages. This means that a French speaker will have different challenges compared to a Chinese speaker when learning English pronunciation. For this reason, I have created a guide for each language, which prioritises the most important sounds to learn. The guide also gives examples of words from your native language in order to clarify the differences between English and your mother tongue. Of course variation exists within each language: for example, there are many different varieties of Arabic. However all speakers of a language will usually have similar challenges when approaching a language like English. Where necessary, reference is made to specific varieties (for example a sound that is more important for Brazilian Portuguese speakers to learn rather than European Portuguese speakers). In the guide for Chinese there are references to specific languages, such as Mandarin, Cantonese and Southern Min. If your native language is not listed then you can email me (Luke@ImproveYourAccent.co.uk) and I will add it as soon as I can. Of course you can take the course if your native language is not listed, and browse through all the worksheets – but you won’t be guided through it. Is the course taught in English or my native language? Can I preview the course before paying? You can watch a video lesson on the Schwa sound here. The course includes detailed information on all the vowels and consonants in English, as well as rhythm, intonation and voice quality. You don’t have to learn everything in the course (because what you study depends on your native language), but it’s nice to have all the information available. You can take a look at the contents page here. Do I need any previous knowledge of pronunciation before taking the course? No, the course will teach you everything you need to know. Is this a phonetics course? No, the priority of this course is for you to sound more English as quickly and effectively as possible. I certainly explain IPA (International Phonetic Alphabet) symbols and how they can be useful, but I do not go into detail with phonetic/phonological issues. IPA symbols are used as a tool in the course – but I use lots of different tools to help you. So even if you don’t use the IPA, you will still progress well. Does the course work on computers/laptops/tablets/phones? Yes. You access the course through your internet browser so you can access it through any device. However, the course will work best on tablets and laptops/computers because the screen size is bigger. Will I need internet access to use the course? Yes, you will need to be connected to the internet to use the course. Please ensure that your internet plan gives you enough data to watch videos in the course. The three options refer to the amount of time you have to study the course. Obviously the more time you have, the better. Once you have made a purchase, you will be able to see all of the lessons and all of the content immediately. So if you buy 15 weeks’ access you will be able to see everything in the course – but only for 15 weeks. Purchasing Unlimited Access means that you do not need to worry about time. If I buy the 15 or 40 weeks' access, can I upgrade to unlimited access? Yes, if you buy the 15 or 40 weeks’ access you will have the option to upgrade to the unlimited access at a later date. The price you will pay for upgrading will be the difference between the price of 15 or 40 weeks and the price of unlimited access. Please note that I reserve the right to change the price of unlimited access at any time. There is no option to upgrade from 15 weeks’ access to 40 weeks’ access. If I choose 15 weeks' access, will I have time to complete all the course materials? The 15 weeks’ access option is for those with limited time, or for those on a budget. It is unlikely that you will be able to cover everything in the course in 15 weeks. You should still be able to learn a lot and make some good improvements, but I would recommend either 40 weeks’ access or Unlimited Access to gain a fuller understanding. How does this online course compare with private face-to-face lessons? If you buy 40 weeks’ access for £399, it works out at under £10 per week. (Remember that this includes over 80 video lessons.) In comparison, I charge £79 an hour for lessons. 2. You may understand a pronunciation topic in a lesson, but not the next day. With the online course, you can repeat lessons whenever you want and you don’t have to rely on a teacher. You have access to the course 24/7. 3. You have hours of high-quality video or audio materials to practise with at home. The recordings are of a contemporary British English accent. I know that this is a self-study course, but how can I book private lessons with you? The Online English Pronunciation Course does not include any private lessons with me, however you can contact me to book a lesson in London or via Skype. I work for a business. Can I use your course with my employees? I'm a teacher. Can I use your course materials with my students? After taking lessons, you will have a deeper understanding of how English pronunciation works and will be able to communicate more effectively in English. In the first lesson I will do a thorough assessment of your accent and then recommend how many lessons it would be useful to take. For this reason, I suggest booking one lesson first. This also gives you a chance to ensure you are happy with my teaching before committing to further lessons. Most students take one lesson per week. However, I’m flexible to your learning needs. I suggest that you start with one lesson per week – and if necessary we can change this to every two/three/four weeks depending on how much time you need to practise and revise between lessons. Do you provide study materials so I can practise at home? Yes! After every lesson you receive a personalised lesson summary with advice, as well as worksheets and audio of native English speakers to help you practise at home. I also record you in the lesson so you have references to listen to. This is all included in the cost of the lesson. Do I need an advanced level of English? The lessons are suitable for people with a high-intermediate or advanced level of English. Why should I choose you to teach me? Knowledge: I am qualified by the International Phonetic Association (as well as having a first-class degree in languages). Experience: I have taught people from over 80 different countries. Attitude: I thoroughly enjoy my job! Why private lessons rather than group classes? Lessons are 100% tailored to your needs. Flexible lesson times that fit into your schedule. 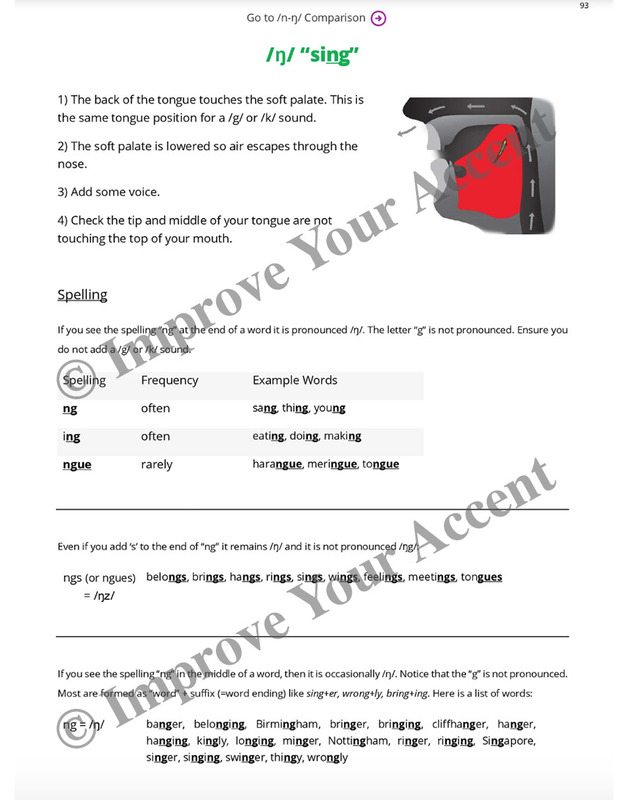 We work on the sounds that will make the biggest improvement to your specific accent first. In the first lesson I record you reading a text which contains all the sounds in English. This recording acts as a benchmark. We can then re-record the text to measure your improvement. Yes, I do. Please contact me with your specific requirements. Do you teach native English speakers? 2) People can’t understand what you’re saying. Your background is part of your USP (Unique Selling Point) and having an accent is a positive attribute. Remember that your accent reflects your identity – so having a hint of Cockney/Scouse/Geordie shows people who you are. Also, note that your accent changes throughout your life depending on who you socialise/work with or where you’ve travelled. This is normal. If you are being bullied/discriminated against because of your accent, then take action to stop it (speak to HR or an anti-bullying organisation for advice). On the other hand, it might not be your accent that is the issue but your voice. Perhaps you feel it is too quiet/tinny/breathy etc. Or you are lacking in confidence when you speak to others/when you give a presentation at work. In which case I suggest you find a voice coach who will be able to help you with this. No, I only teach adults (18 and above). Yes, it does! I find it very effective. It’s important to check that you have a stable internet connection, you have set up Skype correctly, and your video and audio work well. What happens if there are connection problems during the lesson? I have a very stable and fast broadband connection (ultraband), so there should not be problems. There is no refund for connection problems that may delay or disrupt the lesson. You can pay securely by credit/debit card on my website. Payment for lessons must be received 48 hours in advance. Contact me to book a lesson, and then I shall send you the payment link. Can I buy lessons for someone as a present? If you reschedule or cancel a lesson with less than 48 hours’ notice, then you will be charged for the lesson. Payment must be made 48 hours in advance to confirm a lesson. Lessons are 1 hour long (unless otherwise arranged). If you are late, the lesson will still end at the scheduled time and lesson time will not be made up. If you buy the 5-lesson package, 5 hours must be taken within 2 months of purchase. No refund will be given after this time. If you buy the 10-lesson package, 10 hours must be taken within 4 months of purchase. No refund will be given after this time. Skype lessons: there will be no refund for connection problems that disrupt or delay the lesson. If you have any other questions, just contact me!